Gold lost traction during yesterday's session and continue to do so this morning as the greenback made a strong comeback despite the still existing risk-on mood. The slip came after the greenback surge following the release of stronger than expected core PPI for November and a relatively positive tone around the US treasury yields. However, the US-China trade optimism remains a concern to investors as the dispute and the threats are still ongoing. Gold's double top formation has let prices to retreat from recent highs and with more downside to watch out from. 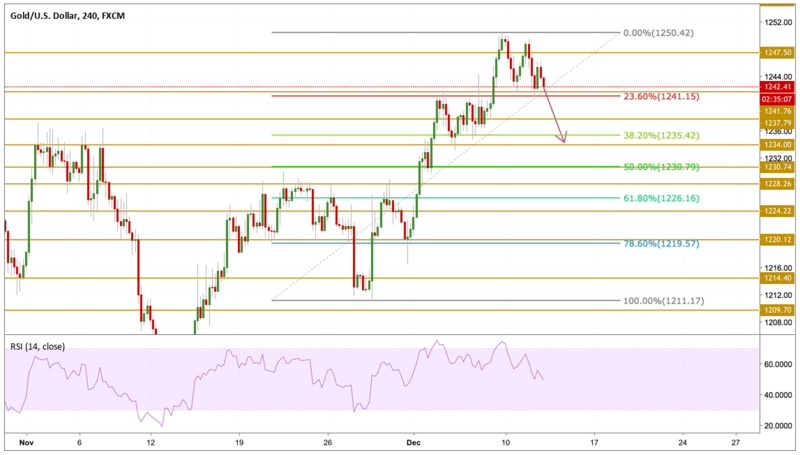 The RSI has recovered from the overbought state and is now in a bearish mode that can allow the 1241.76 support level to be violated to the downside. Today we will be watching the 1234 support level as it also coincides with the 38.2% Fib retracement level.